TORONTO - Frustrated with a lack of female-targeted resources to help women learn high-tech skills for today's digital world, Heather Payne decided to act. 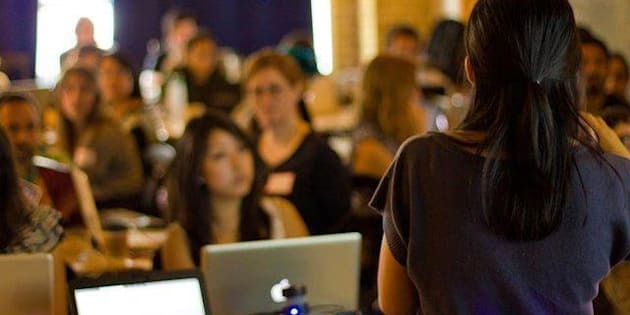 The 25-year-old's brainwave is Toronto-based non-profit Ladies Learning Code, a group that aims to "empower everyone to feel comfortable learning beginner-friendly technical skills in a social, collaborative way." "We all see the issue of women (underrepresented) in technology and it hasn't gone away," says Payne, who launched the organization with its first seminar last July. She herself had a non-technical background when she got the idea, inspired by a workshop in the U.S. for women to learn the computer programming language Python. Payne had started dabbling in web design and quickly got hooked but had trouble moving on to the next level. "I had so much fun that I could spend like eight hours a day or more just working on my site and fixing things and tweaking the code — and so I got kind of addicted," she says. "I wanted to keep learning more and I thought about the idea of learning a programming language so I could start to build some simple applications. That's when I kind of got frustrated, it was hard to know what exactly to learn, or what tutorials to try, and it was isolating because I didn't know anybody else who wanted to learn this as well." When she first pitched the idea of Ladies Learning Code on her blog and Twitter, she was surprised by the enthusiastic response. "The first workshop sold out in a day," she recalls. In the early going, workshops — which usually cost about $45 — were held once a month. This year, the schedule was boosted to an average of two or more workshops a month. Less than a year after its launch, Ladies Learning Code will welcome its 1,000th user at its next event this week, about Python. The non-profit has also branched out into different types of events, including week-long day camps for tweens and a mother-daughter learning event scheduled for Mother's Day. Payne has heard from women around Canada who'd love to take part in her seminars but so far, there are no expansion plans. "The idea of managing events in multiple cities is pretty intimidating," Payne says. "There's certainly been interest so we'd love to find a way to make it work.... We see how Ladies Learning Code has caught on, it's been way more than any of us could have ever expected. I didn't think there were this many people in Toronto who would be interested in something like this." She says it's been rewarding getting feedback from workshop attendees about the impact the program has had on their personal development. "There are a lot of stories that this was something that they needed to help them sort of get over the barrier of getting started and show them it is something they can do," Payne says. "And then a lot of people are finding that they kind of get a little bit addicted to it, it becomes really exciting and rewarding. "I'm regularly blown away by how supportive everyone has been and I can't help but be hopeful that it continues."